Maurice Levy began in the toy industry in 1966 before the company MJM Australia started importing in 1993. Maurice's sons took over in 2001 as they continue to grow in the jigsaw puzzle business today. 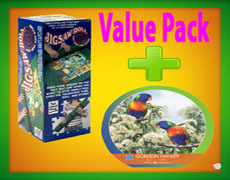 MJM are a market leader in children's licensed jigsaw puzzles and games and sell their products under the brand Crown Products.